We found a few eggs but not as many as I was hoping to see. As on my previous trip, a swallowtail and some smaller butterflies were enjoying the lovely milkweed blossoms. Soon, we were joined by a monarch! It was a male, and I wondered if it was the same one I had spotted a couple of weeks before. Where was the female who had laid the eggs? 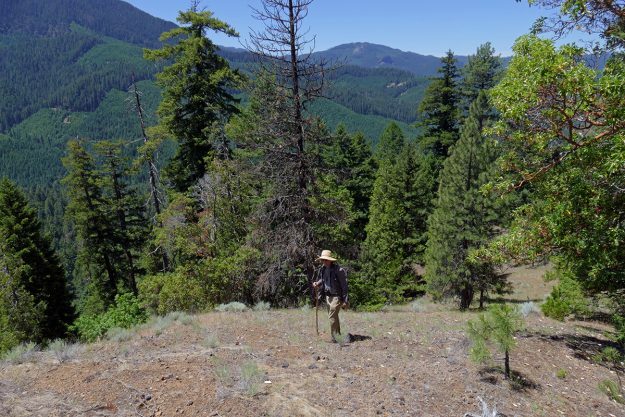 Jenny had never been to the rocky area I’m calling Rabbitbrush Ridge, so after a quick look around the main part of Grassy Glade, we headed down the steep, rocky area at the end of Road 262. Jenny was extra cautious, having had knee surgery, but she was able to make it all the way down. Before we opened up onto the slope, we passed a spot along the ridge where I had been surprised to pick up a beer bottle on my last trip. I was complaining about people leaving litter in a lovely place like this when I noticed 3 little coin envelopes lying on the ground—my seed envelopes from that same trip! Guess I shouldn’t be so quick to judge! Thankfully, I was able to clean up after myself before anyone else could complain about me littering. While out on the ridge, we were very pleased to see there were a number of monarch eggs on the milkweed, so the monarchs were coming out here as well. 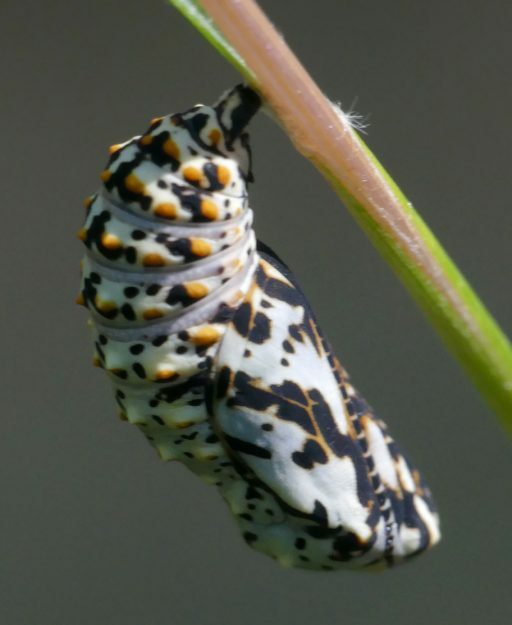 Over the course of the day, we also found a number of other eggs, cocoons, and other insects using the milkweed. It certainly is a valuable plant to many insects besides monarchs. 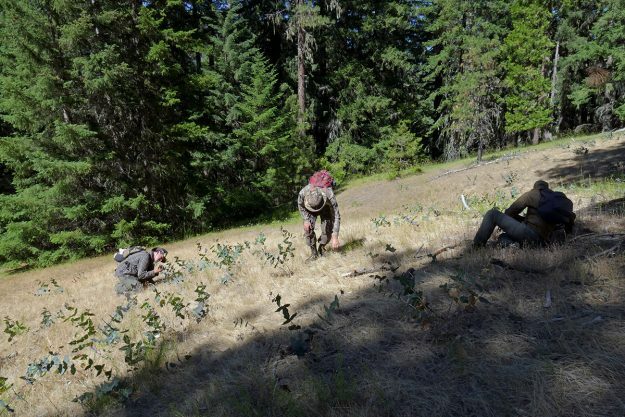 The following week, on July 3, I went back to Grassy Glade with Joe Doerr, Willamette National Forest wildlife biologist, and Kris, Nate, and Harbor from Walama Restoration, who have been doing restoration work on my property for a few years. I’m used to watching them dig up blackberries and false brome, so it was fun to be out exploring with them instead. They really seemed to enjoy being outside without having to work so hard. Nate spotted this snowberry checkerspot chrysalis attached to a blade of grass. We again started out checking for eggs and caterpillars in the clearing by the road and were very excited to finally spot a few small caterpillars, both 1st and 2nd instar ones. We hoped to see a monarch but were disappointed. Joe and I wanted to do some more exploring down through the woods as we had run out of time on our earlier trip when we found milkweed down in the area he named “Rocky Glade” (see More Milkweed Near Grassy Glade). There are several openings in the woods south of Grassy Glade; Rocky Glade is the most northwesterly, so we headed straight south to the ones we hadn’t seen yet. We were thrilled to find milkweed in the first large one and proceeded to survey it as best we could. 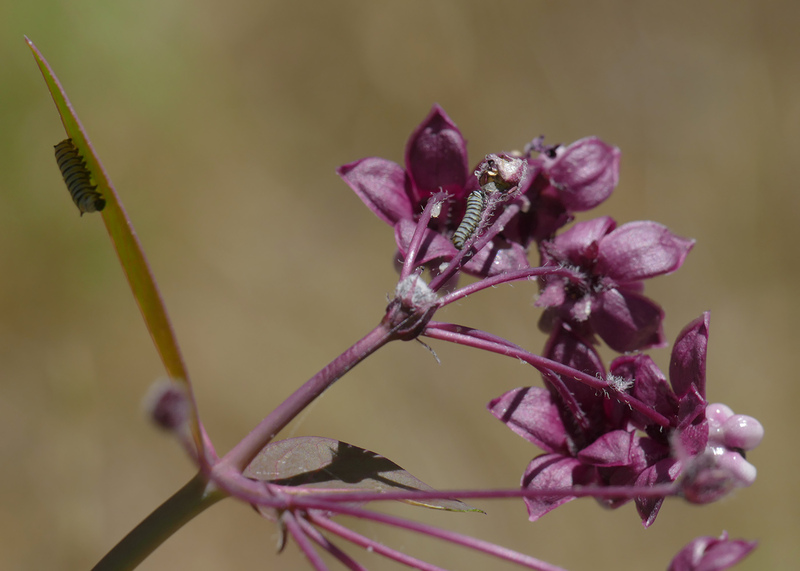 I counted milkweed plants and stalks while the guys looked for caterpillars and eggs. There was a gorgeous large western mock orange (Philadelphus lewisii) in full bloom, so I named the site “Mock Orange Glade” since no one had any better ideas. Following the aerial image on my phone, it was pretty easy to find the southernmost opening. 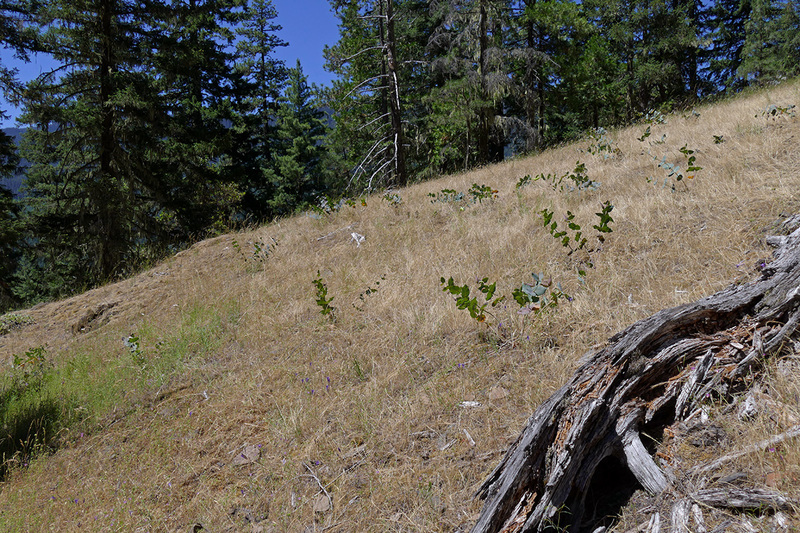 There was no milkweed here, but it wasn’t as steeply sloped and rocky as the other two openings. It looked like it might have had a nice show of earlier flowers, but there wasn’t much to look at in July. There was still time to do more, so we decided to go back to Rocky Glade, passing once again through Mock Orange Glade. The mock orange was now in the sun and attracting a number of butterflies but still no monarchs. The only monarch I saw in the Rigdon area, this male was still at Grassy Glade a little over 3 weeks after I first saw him. Note the outermost 6th white dot from the tip of his right upper wing doesn’t have a matching dot above it. On his left wing, the dot is there but faint. Their dot patterns are like thumbprints, similar but unique. When we arrived at Rocky Glade, we were happy to see some great butterfly nectar species still in bloom, including Oregon sunshine (Eriophyllum lanatum), ookow (Dichelostemma congestum), mountain thistle (Cirsium remotifolium), and northern buckwheat (Eriogonum compositum). But the real thrill was seeing a monarch flying around! While the guys continued to look for caterpillars and eggs, I was determined to get a photo of the monarch. I really wanted to know if he might be the same one I’d seen before. He was really a tease, flying nearby then suddenly wafting all the way up the top of the slope, only to come sailing back down again. Eventually, I was able to get some adequate photos of his upper side. Comparing the dot patterns on his wings with the older photos when I got home, I was really excited to find it was indeed the same butterfly I’d first seen 22 days earlier! One of my many questions about the Rigdon monarchs was whether this was their final destination or just a way stop on their way north. Short of tagging the butterflies we found, this was the best way I know to get some data on the amount of time they spend in one area and how much they move around. It hasn’t proven to be a very good year for the monarchs. The folks down in the southwestern part of the state have seen far fewer than previous years. 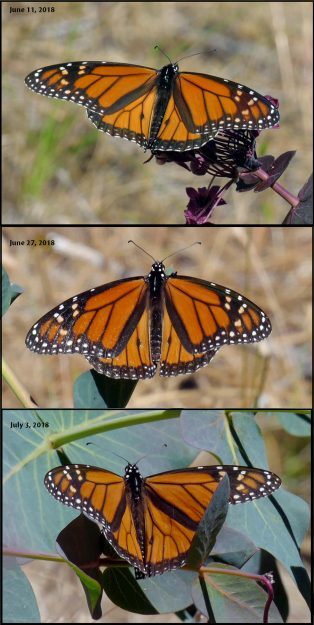 We only have one year of data for the Rigdon area monarchs, but there have definitely been fewer eggs, caterpillars, and adults seen compared to last year. 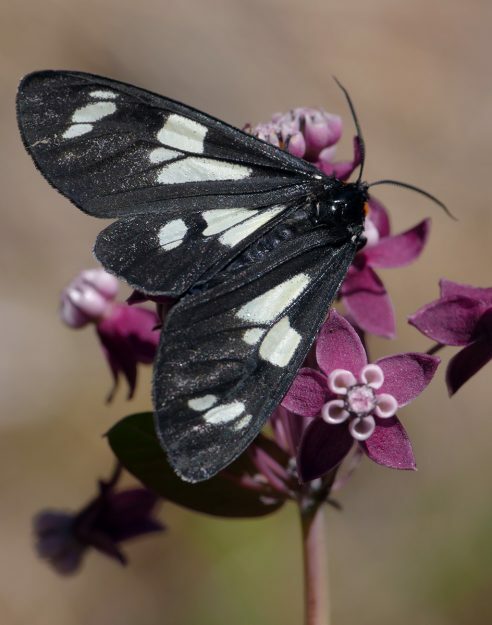 We’ve learned a lot about the milkweed in the area and even found more populations. And it seems like the milkweed is increasing. I only hope there will still be monarchs to enjoy it in the future. MANY THANKS, Tanya – for your trips and forays out into these areas in order to monitor the butterflies and plants. It’s wonderful for those of us who for various reasons don’t get out there into the hills. LOVE your pictures and informational updates.